The breakfast at “Hotel Southern Coast Miyakojima” is a buffet style. It is served at a restaurant “Soleil” located on the first floor of the hotel. When you have a breakfast, don’t forget to bring a breakfast ticket which was given upon checking in. 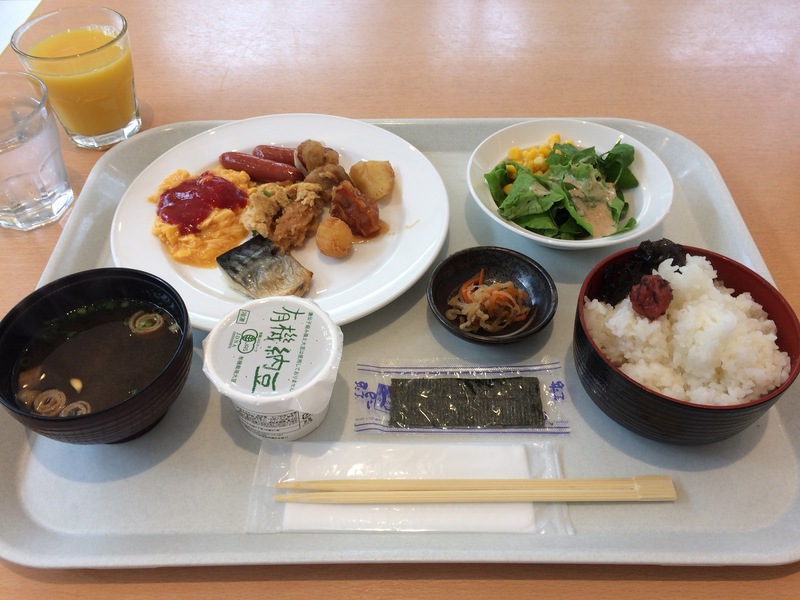 Non-hotel guests can also have a breakfast for 1,000 yen per person. By the way, please refer to the following article for other hotel information. The breakfast time is from 7:00 to 10:00 am. Most of the menus are Japanese dishes, but as I prefer to have bread and coffee for breakfast, I decided to have a western breakfast (bread, scrambled eggs, etc.) on the first morning. The breakfast was nice, but bread and eggs don’t make much difference wherever you eat them, unless they use extraordinary ingredients. In addition, I hate taking time to bake bread. A variety of Japanese food served at the restaurant looked very attractive, so, from the next morning, I changed to a Japanese breakfast. Grilled fish, miso (soybean paste) soup, natto (fermented soybean), pickled plum, and laver…a traditional Japanese breakfast. Every dish was very nice, and I ended up having a big meal from the morning. It’s one of the charms of Japanese-style breakfast that you can enjoy a variety of small dishes (it must be hard to prepare such a breakfast from morning at home!). I could relax and feel comfortable in the spacious restaurant, with the sun shining through the window in a tropical atmosphere. Depending on the hour, almost all tables were occupied at the restaurant, but basically the restaurant was quiet and I wasn’t bothered at all (I think most guests were Japanese). Basically I don’t like a buffet-style breakfast at a hotel as I end up having same breakfast everyday (bread, eggs, and coffee) and will be fed up with noisy group customers, so now I rarely eat breakfast while staying in a hotel in a foreign country. But I had breakfast everyday while staying in “Hotel Southern Coast Miyakojima” for four nights as Japanese food was really nice. I recommend you have a Japanese breakfast using local ingredients if you stay at a hotel in Japan (not to mention a hot spring inn). The lunch served at the restaurant has a good reputation too. I had a lunch once while staying in the hotel, and I ordered a beef stew (this month’s special menu) for the lunch. It came with a salad, rice, and dessert. Soup and drink are self-service, and you can have free refills. The price of beef stew is 1,200 yen and is not cheap (it’s normal at a hotel restaurant), but it contained lots of tender meat, and its taste was very delicious. I felt like having a beef stew in an expensive French restaurant. Meals were very impressive at “Hotel Southern Coast Miyakojima.” So, if you stay at the hotel, don’t forget to enjoy delicious breakfast and lunch at the restaurant!